Fat loss the Venus way is not a quick-fix gimmick. It's fat loss for life. So we don't expect you to drink meal replacement shakes and live off crazy diet foods. We want you to eat real, nourishing meals made from nutrient-dense ingredients. To put it simply, we want you to eat in a way you can sustain for life. Our ethos is that fat loss is achieved by small, consistent changes which fit easily into your lifestyle. 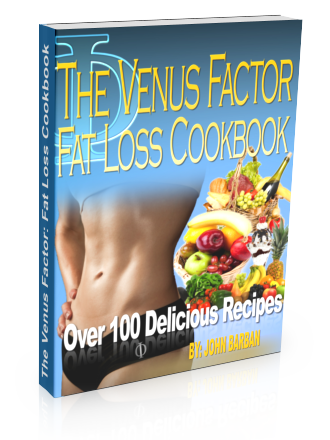 Download the Venus Factor Cookbook to discover common home-cooked meals, family favourites, special occasion recipes, and even desserts done the Venus way. The focus is on meals you'll feel comfortable preparing, cooking and eating for life. There's plenty of variety and some new ideas to try. All feature lower-calorie swaps which demonstrate just how simple fat loss can be when you know the recipe! What will you cook first?